With a long drive and border crossing ahead of us, we left Canmore at dawn, headed east towards Calgary. After the Calgary bypass started a long three hour drive south through farm land and plains, via the town of Cardston to the border. 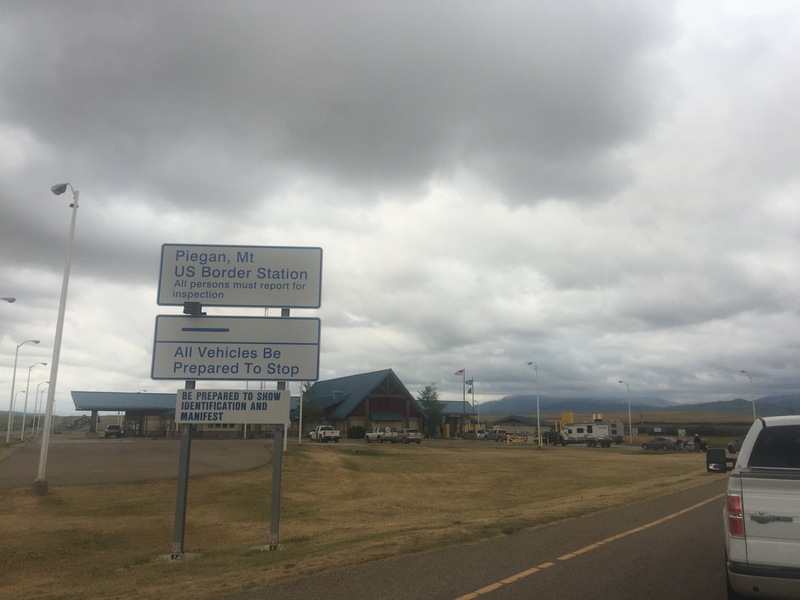 We arrived at the Piegan Border Crossing on schedule at 11.30am, to discover that there was only one lane open – meaning over an hours wait to get across. After a quick stop to get Andy and Vanessa’s passports stamped we were back on the road in northern Montana. We entered the Park at the St Mary entrance where the Ranger recommended we purchase an Annual Pass for $80 which covered all National Park Service parks – it would turn out to be a great investment as we ticked off Park after Park. Our first stop was at a viewing point looking out to ‘Goat Island’ a small tree covered rock in the middle of Saint Mary Lake. It made for a striking photo set in the dark waters of the Lake, with steep mountains rising on either side. As we wounded through the Rocky Mountains we came to a bend with dozens of cars were parked at odd angles of the side of the road and everyone out of their cars pointing. Curious we joined the crowds with some illegal parking and wander across to a small verge above a small pond on a mountains edge. A lady proudly declared that she’d spotted a grizzly bear, pointing out a slow moving brown figure on the hill above – out of the range of our cameras. While hard to make out amongst the vegetation and rocks it was clear that it was a young grizzly bear, walking slowly up the hillside away from the growing crowds. We had officially seen a grizzly bear in the wild! After watching the bear for 15mins we continued onto the world-famous Going-to-the-Sun Road, one of the world’s most spectacular highways. 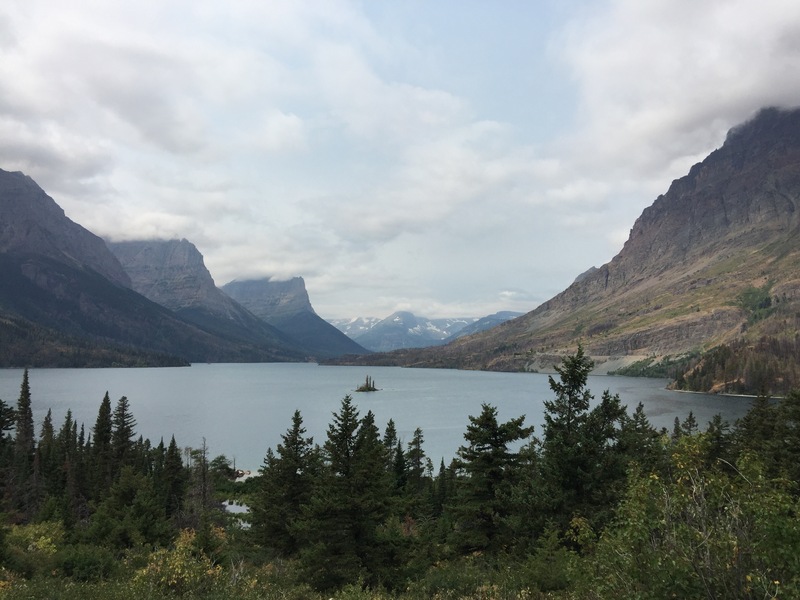 The 50 mile long winding scenic road bisects the heart of the glacier, hugging the cliffs and following the shores of the Parks two largest lakes; St Mary Lake and Lake McDonald. We stopped to take in spectacular views across the valley with fields of purple flowers in bloom. 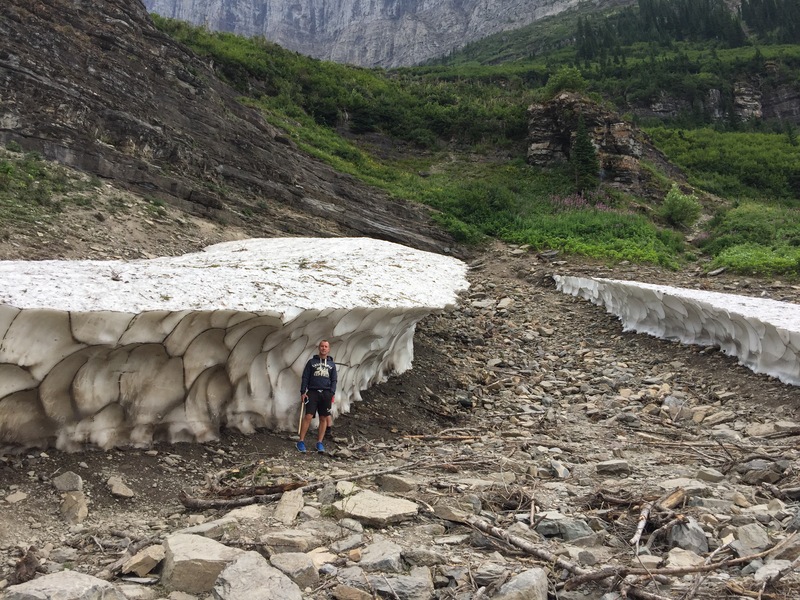 On the mountain side of the road a large frozen snow wall was slowly thawing, leaving an icy ridge which tourists posed next. We stopped at the Lake McDonald Lodge for a short lunch break and a photo along the rivers edge. 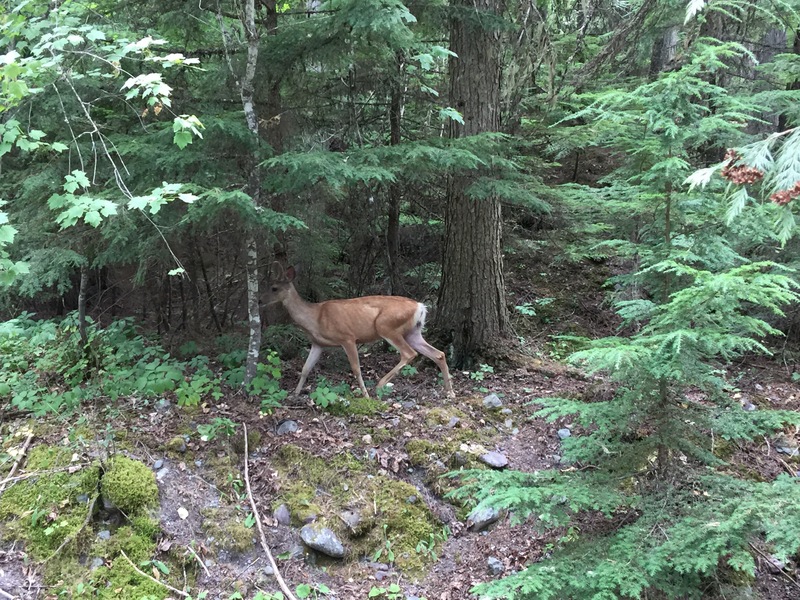 As we got back to the car a deer emerged from the woods before darting back into the undergrowth when I got too close. As we exited the park at the Two Medicine Entrance the windy mountain roads gave way to endless fields of grass for animal feed – which was suddenly broken by an explosion of colour from a field of sun flowers. In need of a break we pulled over to admire then flowers and send LARS up for a few photos of the flowers and distant farm house. We hopped back in the car just in time as the heavens opened for a short but intense rain shower that left a perfect rainbow over the fields. Our mammoth drive south took us nearly two hours before we arrived at our destination. We entered Helena through more roadworks, finding our roadside motel and checking in. After a long days drive we decided to head out for some food via a quick stop at the Montana State Capitol building. 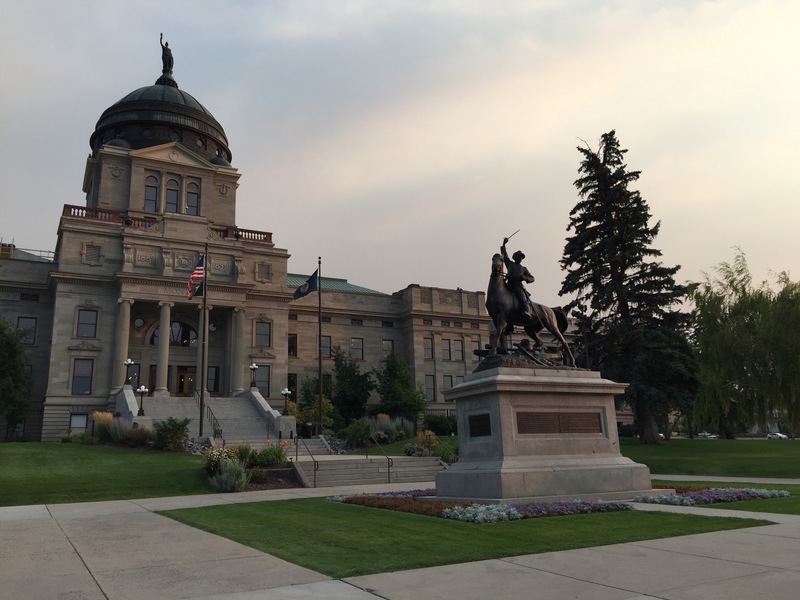 The beautiful historic building, built in 1902 and located in well kept gardens is home to the Montana State Legislature. Our choice of a grill restaurant turned out to be more like a McDonalds with table service, but it was nonetheless tasty and did the job. Yet again we opted for an early night. I think it is a thing of great beauty to spot a grizzly in the wilds – more so from a distance. Cheers.